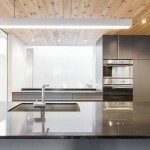 Waverly Residence, located just south of Jean-Talon Street in Alexandra-Marconi district is the result of the idea of creating a very modern living place for wealthy clients in this up and coming neighborhood. 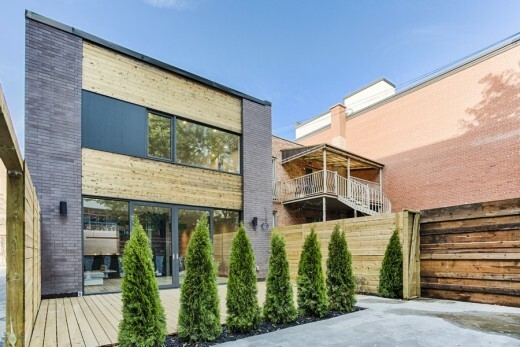 Alexandra-Marconi is a landlocked district between the Canadian Pacific Railway in the west, The Little Italy to the east, south of Beaubien Street and Jean-Talon Street to the north; A mysterious district that has in recent years, experienced a notorious gentrification. 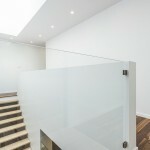 The project started with a duplex, almost all of the existing structure was entirely rebuilt. A dozen feet on two floors were added to the rear of the old building. Moreover, excavating the basement, the residence finally went from 1500 to 3000sq.ft. On the same lot, facing south-west, a large courtyard was added to enjoy the sun. MU Architecture wanted to design an architecture that confronts, destabilizes and fascinates. 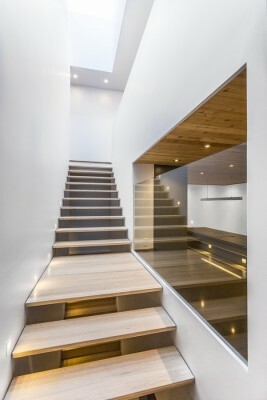 The wooden steps, inserted between the two parallel walls without silt, seem to levitate. The shadow line formed by light above accentuates this effect. 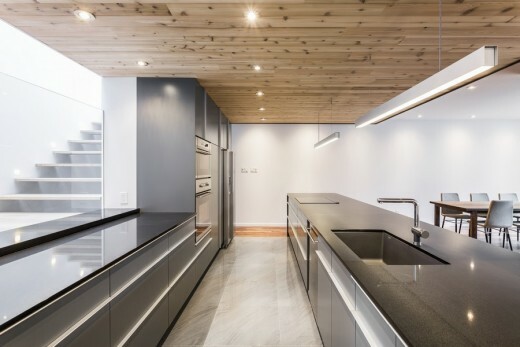 A large window closes the large opening to the kitchen, allowing it to also benefit from the presence of skylights. 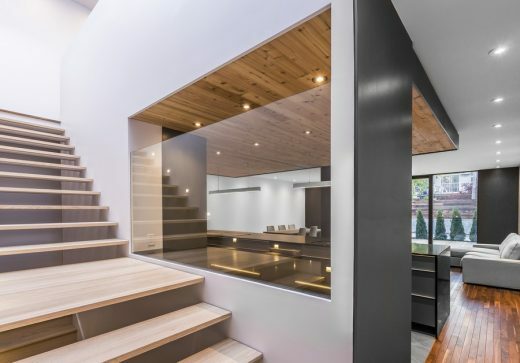 This same transparent wall creates a surprising illusion that the landing of the staircase is the extension of the kitchen counter. 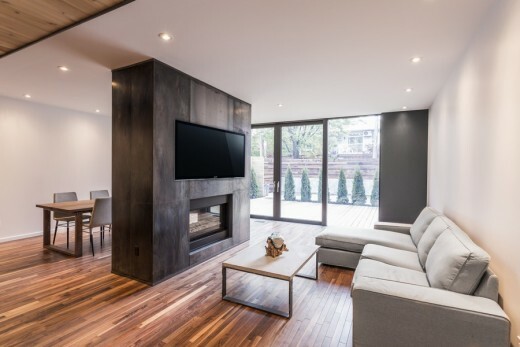 In the living room, the monumental fireplace covered with raw steel panels divides the space into two areas. 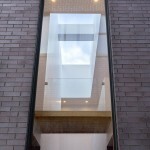 Large sliding windows fill the back wall with an opening to the terrace in the courtyard. All the rooms on the ground floor are generously filled with unobtrusive natural light that accentuates the theatrical effect of the place. 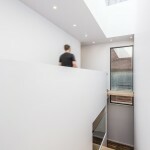 The upper floor is divided in order to accommodate three bedrooms. Two of them located above the entrance, to the street side, and another, intended for masters, located at the back overlooking the terrace. A full bathroom also benefits from light provided by another skylight. The laundry room is also found on the floor next to the rooms. There is enough space on the landing to consider installing an office and or a library. The basement houses the mechanical equipment and the seasonal storage but also a large games room hidden at the end in the newly excavated part of the residence. 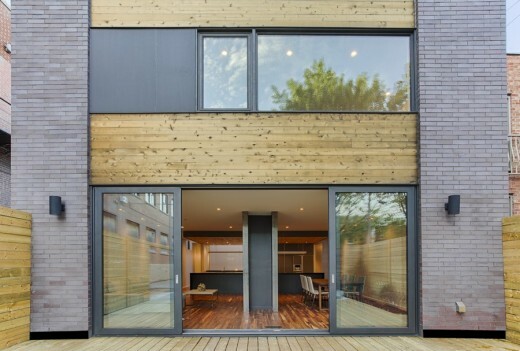 The Waverly residence is consistent in its realization with the requirements of a family living in urban areas. The characteristics of its facades show the architectural characteristics of its half residential, half industrial location. The Marquise consists of a single steel panel folded upward to cover the main entry steps below. 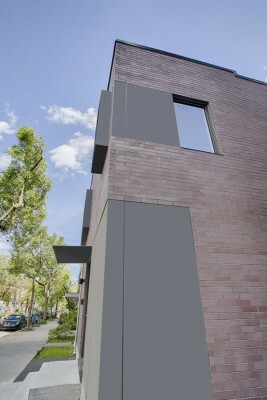 The black steel frames of the windows of the facade accentuate the cuts openings. The rigorous alignments of the black steel frames around the windows reveal the rigorous design of the facade. 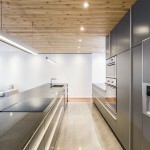 Even if the volumes are clearly defined, the surfaces are elegantly positioned without being chaotic. The brick chosen for the facades, inspired by those that have been traditionally used for industrial buildings sector shows subtle brightness variations that animate the surfaces that would otherwise be too uniform and blend. The use of gray painted steel panels softens and balances the aggressiveness of the voluntarily contrasting black and pink bricks. 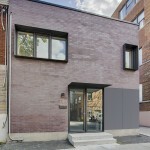 This residence foreshadows future achievements envisaged in this area, in connection with the impending developments of the former train yard and new construction in progress on Jean-Talon Street.